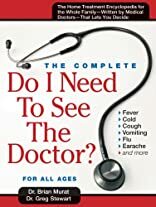 "Do I Need to See the Doctor? belongs in every household.... Its beauty lies in its simplicity; this book is about empowerment." With easy-to-follow flow charts and photographs, colour-coded chapters and over 70 health issues, Do I Need to See the Doctor offers Canadian parents the very best kind of support: peace of mind. Late-night fever? Sudden ear ache? Just flip open the book and follow the coloured flow charts. Parents will find a detailed, at-home care guide, as well as medical doctors' advice on when to be treated by a professional. Now you can rest assured that you know the very best ways to take care of your family's health needs, as well as exactly when to get help from a doctor or medical professional. Better yet, because you have followed the same step-by-step treatment plan that doctors use, your arrival at the hospital or doctor's office is always warranted. This means fewer trips to the doctor, shorter wait times at the hospital, as well as professional guidance for you at home - this book truly is a must-have for every Canadian home, summer camp, school and cottage. About Brian Murat (Author) : Brian Murat is a published author. A published credit of Brian Murat is Do I Need to See the Doctor? : The Home-treatment Encyclopedia, Written by Medical Doctors, That Lets You Decide. About Greg Stewart (Author) : Greg Stewart is a published author. A published credit of Greg Stewart is Do I Need to See the Doctor? : The Home-treatment Encyclopedia, Written by Medical Doctors, That Lets You Decide. About Murat (Author) : Murat is a published author. Published credits of Murat include Do I Need to See the Doctor? : The Home-treatment Encyclopedia, Written by Medical Doctors, That Lets You Decide.